Summer is over, but there are still a few weeks of good weather left for swimming. To get you in the mood to put your bathing suit on, take a look at these interesting facts about swimwear. These days, beachgoers can get away with wearing very little, but a hundred years ago things were quite different. At the turn of the twentieth century, women had to wear long dresses at the beach. In 1907, an Australian swimmer was even arrested for wearing a suit that revealed her arms and legs. This attitude began to change in the 1930s when sunbathing became a popular activity. The modern bikini was invented in 1946 and named after a group of islands in the South Pacific. Here, the United States tested bombs. Most likely, the bikini’s French inventor hoped that the public’s reaction to his new swimsuit design would be similarly "explosive." Although bikinis appear to be modern, wall paintings that date back to at least 1600 BC show women who are dressed in clothes that look very similar to today’s bikinis. A: See you later, Mom. I’m going out with my friends. B:	Hold your horses! Have you finished your homework? 2015/09/21(一) Although bikinis appear to be modern, wall paintings that date back to at least 1600 BC show women who are dressed in clothes that look very similar to today’s bikinis. 2015/09/22(二) As you can see, swimwear has come a long way, and it has made a splash with each new development. 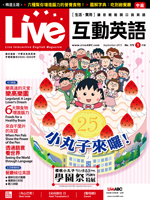 The Japanese anime series Chibi Maruko Chan turns twenty-five this year, and it continues to warm everyone’s hearts. 2015/09/24(四) Blueberries and strawberries have also been shown to lower the risk of age-related diseases like Alzheimer’s. 2015/09/25(五) Chocolate lovers will be happy to know that eating dark chocolate, which is made from cocoa, can increase our brain power.